Tip: Slowly cooked until tender. 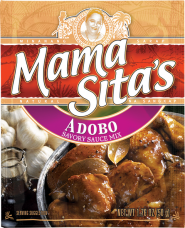 Mama Sita’s Adobo Marinade can used instead of the Mama Sita’s Adobo Mix. Marinate beef in dissolved Mama Sita’s Adobo (Savory Sauce) Mix for at least 4 hours. In a pan, heat ¼ cup oil and pan-fry the beef until brown. Add 4 cups water. Let boil and simmer until it becomes tender. In a pan, heat ¼ cup oil and sauté shallots. 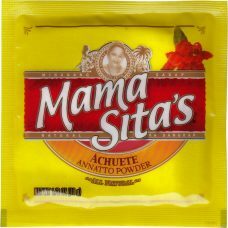 Add the patis, Mama Sita’s Achuete (Annatto) Powder, the remaining marinade and salt to the beef. Cover and simmer. Reduce heat. Stir once in a while. Add potatoes when meat is tender. Slice meat crosswise. Arrange on a platter and pour sauce over the meat.